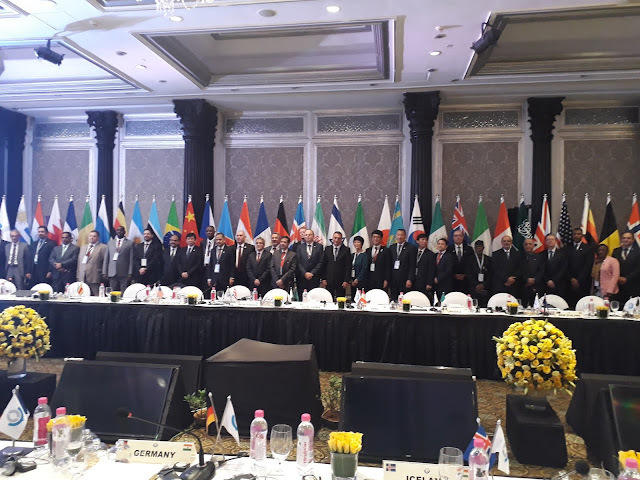 The 80th Session of the Policy Commission of the World Customs Organization (WCO) has started today at Hotel Taj Mahal Palace in Mumbai. The three day long session is hosted by Central Board of Indirect Taxes & Customs (CBIC) and is being attended by Customs heads of 31 countries from all the six regions of the WCO. The session was addressed by the Hon’ble Finance Minister, Sh. Arun Jaitley via video link. He thanked the WCO for giving opportunity to India for conducting Policy Commission. He mentioned about the role of customs in not only collecting revenues but also in other areas like safety, security, facilitation etc. He highlighted some of the key reforms being initiated by Indian Customs, as a result of which, there has been a quantum jump in the ranking for India in World Banks Trading across Border indicator from 146 last year to 80 this year.The Finance Minister also highlighted the role of Customs in ensuring economic competitiveness of goods and services across the border and emphasized that countries aim to minimize trade barriers. Revenue Secretary, Sh. Ajay Bhushan Pandey made the opening remarks and highlighted the importance of communication and coordinated border management. He mentioned about the need to have a balance between facilitation and enforcement and use of digitization and non-intrusive inspection. Secretary General, WCO, Sh. Kunio Mikuriya emphasized that the Gateway of India symbolize "trade, travel and transport for seamless borders" which is also the theme of next years meeting.He highlighted the role played by knowledge in the present era of Knowledge based Customs and reiterated the Indian Finance Ministers vision of trade facilitation as a means of consumers satisfaction.He further proposed that the approach of WCO should go beyond trade facilitation and should involve protection of consumers and security, as it is important for economic competitiveness. Chairperson CBIC, Sh S. Ramesh talked about the importance of Agreement on Trade Facilitation(TFA) and explained the implementation of TFA in India.He appreciated WCO’s theme for 2019, “Smart Borders for seamless Trade, Travel, and Transport”and went in detail to elaborate steps taken by Indian Customs for compliance and facilitation,which are in tune with WCO’s theme. Chairman announced that for the first time, India joins other nations by pledging Rs 5 crores fund for capacity building activities of WCO. The Policy Commission discusses the various policy issues of WCO and outcomes of its various working groups and committees. The session will have intense debates by all the countries on some of the global cross border topics e.g. Trade Facilitation, Security Initiative, Performance Measurement, Combating Illicit Financial Flows, Small Island Economies, Free Trade Zones etc. Indian Customs have been playing very active role in different activities of WCO and conducting of Policy Commission in Mumbai will give a boost to image of the country in the global platform.